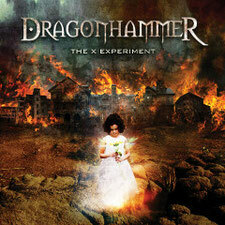 Italian Progressive Power Metal band DRAGONHAMMER will release their long awaited third album "The X Experiment" through My Kingdom Music on December 2nd 2013. Originally the band was formed in 1999 as a trio, and they have released 2 albums. After the release of the 2nd album "Time For Expiation" in 2004, they have gone into a long silence. Now they are back with the 3rd album which is based on a great futuristic concept, a modern fantastic story sets in a post-nuclear world where the chaos reigns, by a new line-up and a support on drums of Davide Folchitto (Stormlord, Screaming Banshee, Prophilax). The new album features special guests, such as Roberto Tiranti (Labyrinth, A.P.D., Mangala Vallis, Ken Hensley's Live Fire) on vocals of "The End Of The World", Titta Tani (Ashent, Phoenix Rising, Takayoshi Ohmura, ex-DGM, drummer for Goblin) on vocals of "My Destiny", Francesco Fareri (Jeff Loomis, Vitalij Kuprij, Vertual Mind) on guitar solo of "My Destiny" and backing female vocals by Marinella Pichierri and Lara Bertoli. It's perfect for a fan of a power metal with a speedy sound, epical melody lines and elements of progressive.